Sidney McDonald, an administration assistant at City Hall, aids visitors as they enter the building in downtown Chattanooga. Call 423-757-6208 to make a tax-deductible donation, clip the coupon with this story and mail it with your check or go to http://www.timesfreepress.com/news/neediestcases/2014/. Sidney McDonald is the first person you see when you walk through the doors of City Hall. 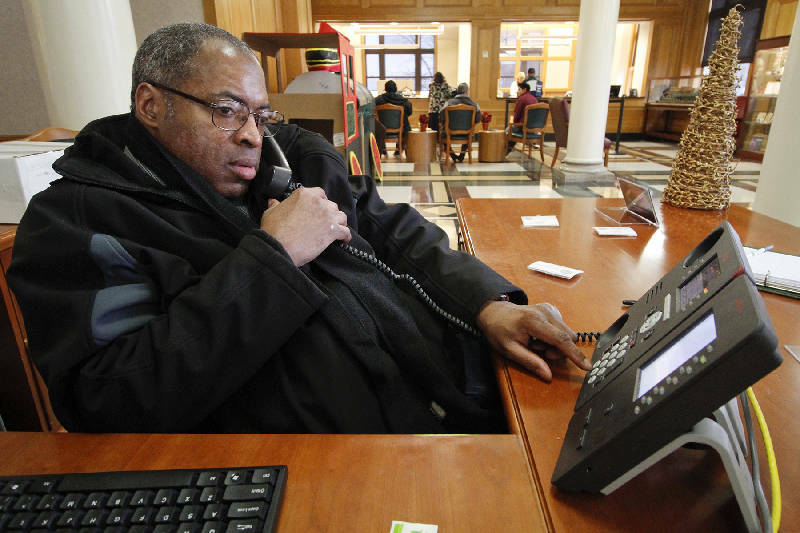 Sitting in his wheelchair behind a large wooden desk, he answers the phone, gives directions and greets everyone who walks in the building with a smile and a handshake. When McDonald is not working at City Hall, he is often found at the Carmike Majestic 12 theater, where he works part-time taking tickets and directing people toward the correct theater. "I like to help people," McDonald said. "And I've been helped a whole lot." McDonald, 50, received help from the Neediest Cases Fund to cover the cost of rent for his apartment in Patten Towers. The Neediest Cases Fund is an assistance program coordinated through the United Way, started 100 years ago in 1914 by The Chattanooga Times newspaper. Throughout the holiday season, the Times Free Press continues the tradition and collects donations from readers to help those in need. McDonald found himself in need after his brother, who had been living with him for awhile, became abusive. "We both just rubbed each other the wrong way," McDonald said. "And then one night, my brother changed and was just not himself. ... He made threats." McDonald said he loves his brother and has forgiven him, but it became clear that they could no longer live together. McDonald said he normally was the one to pay the rent, while his brother helped with food. So when he moved out, McDonald grew concerned about paying for everything alone. The United Way put him in touch with St. Paul's Episcopal Church, which helped him connect with Neediest Cases. Donald Fishburne, rector at St. Paul's, said helping people like McDonald fits into the church's mission -- "those who are least in the way of resources and most in the way of need." Fishburne said it was great to be able to help McDonald, as he is, "obviously someone who rises above physical limitations to gain employment and serve the public." McDonald said he plans to give a donation when he gets his tax refund, so he can help others in the same way he has been helped.